With the PNG National Department of Health - we conduct blood tests; provide bed nets; and work with local schools to reduce malaria. Support the Ministry of Health, Solomon Islands. We empower villagers to keep their villages clean and to reduce mosquito habitats. Rotarians Against Malaria (RAM) is a volunteer-run organisation working to eliminate malaria. 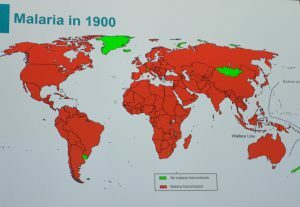 In 1900s, malaria was pandemic in the world. 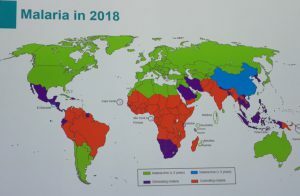 One can only imagine the burden of malaria disease to all countries. Progress has been made. Fifteen years ago, malaria killed a child every 30 seconds. Under the Millennium Development Goals, however, considerable progress was made in preventing, diagnosing and treating malaria. As a result, deaths have fallen by 60 percent. Now, under the ambitious Sustainable Development Goals, we are aiming to reduce malaria cases and deaths by a further 90 percent by 2030. 2018 has been a big year for RAM with significant developments in our three focus countries and planning underway to develop projects in NTT (Indonesia) and in Vanuatu. We made some great connections and learned a lot through our involvement in the World Malaria Congress and the instigation of CS4ME (Civil Society for Malaria Elimination). Our annual Conference this year was hosted by Griffith University and provided a great opportunity for review and planning as well as seeing firsthand the facility behind the current phase one human trials for the malaria vaccine candidate PlasProtecT®. 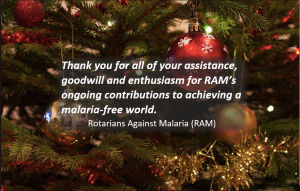 On behalf of the RAM Executive Committee I would like to wish you all a safe and happy holiday season in the confident knowledge that RAM’s programs have helped make this a happier time for many families free from the threat of malaria. Go to our Media Resources for copies of the 2018 and previous years’ conference presentations by our guest speakers. 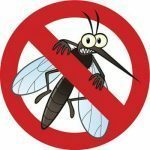 These reports are great sources of information on malaria and current innovations and researches in this field. Follow the links to see details of our programs: Adopt A Village, Chasing Malaria, Healthy Villages, Private Sector, Malaria Awareness Day, RAM PHD Scholarship. For live photos and updates, ‘Like” our Facebook Page! Want to sign up for our RAM mailing list? Subscribe here! See our Galleries for photos of our in-country programs and promotional activities. We facilitate opportunities for Rotarians and Rotaractors, especially those with expertise in medical science and project governance, to visit our in-country programs. In 2017, Dr Jenny Kerrison (PhD, DEd, RN, RM) led a group of RAM volunteers to Timor Leste. A brief RAWCS online report is available at our Newsletters page. District 9810 (Melbourne) hosted a Malaria Awareness Day Dinner on Friday 28th April, raising money for the Walter and Eliza Hall Institute.